The members of the Saskatchewan Royal Purple Association proudly enter into the fifth year of our partnership with SBIA. 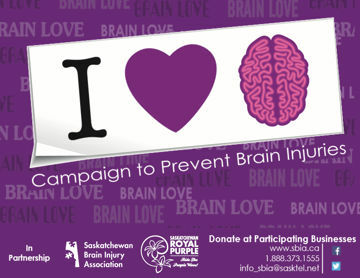 The kick off to the March BrainLove campaign will occur March 1st at the Prince Albert Inn in Prince Albert, SK at 11am when we hope to see contributions and pledges exceeding $20,000 and promises of another year of support. This year we will be concentrating on making a difference in the lives of young people. We will be taking the Wear a Helmet For A Day and the awareness posters to as many schools, clinics and doctor's offices as we can reach in rural Saskatchewan. We will also reach out to communities who need help and establish SBIA support groups. We all have someone in our lives who has been touched by an acquired brain injury. It is a fact that, because of SBIA, our province is one of the leaders In the advocacy for the care of our brain injured population and in the advocacy of prevention programs. What a tremendous achievement. While our numbers may not be large, we are dedicated to assist in not only the fund raising but in all these programs and causes. We know our volunteer efforts and those of SBIA are making a difference in our province. Watch for us in your community proudly wearing our Brainlove T-shirts and our volunteer tags. Say hello and talk to us about brain injury awareness in our province. Join our "Purple wave".